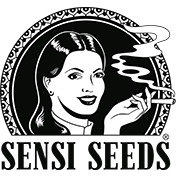 Big Bud is now available from Sensi Seeds as a feminised cannabis strain. Long admired for its superb yield potential this is an 85% indica strain the original cutting of which was back-crossed to an elite Afghani plant after extensive research had identified the genotype used in the original. Further breeding and selection has resulted in this feminised version becoming commercially available. Big Bud feminised is a very versatile plant. Indoors it can be vegged. for a short period before being put into flowering achieving a final height of around 30 cm. Lateral branches are quite rudimentary and therefore SoG is a good choice for maximum yields in small spaces. Alternatively if larger plants are required then vegging for longer can result in huge plants with simply staggering yields. Flowering indoors takes between 50 - 65 days. It can also be grown outdoors but requires a warm, dry climate to fulfil its potential. In developing this feminised version the aroma has been upgraded somewhat with a spiciness added to its sweet fruit. Buds are large, dense and packed full of sparkling resin producing a high which is a strong, physical stone enlivened by the Skunk genes' psychoactive high.